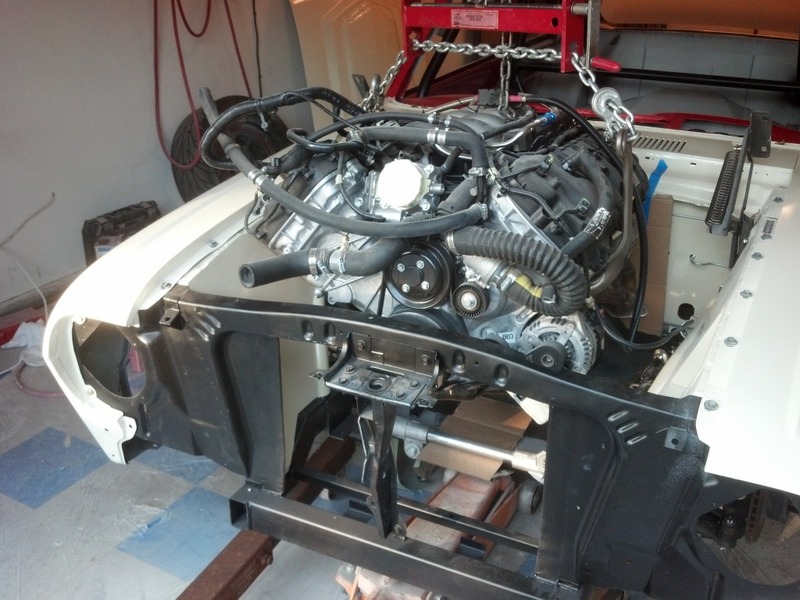 Tom Nash takes his hot rodding pretty seriously and he's a big fan of Ford Coyote power for all his engine swap projects. 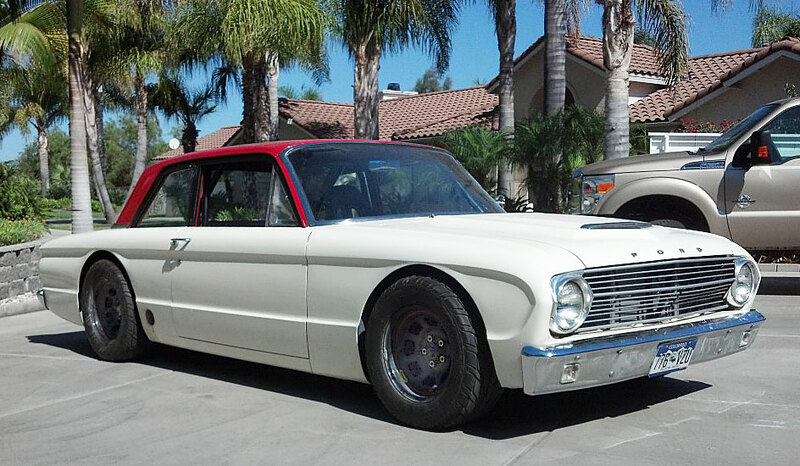 In addition to this 5.0L Coyote powered '63 Falcon, he's also built a Coyote powered '71 Ford Maverick and a Coyote powered 1958 F100 pickup truck. Sharp readers will note something quite savvy about Toms car building philosophy. He chooses vey cool, out of the mainstream vehicles and they all predate the 1975 California cutoff date for smog requirements. So he is free to swap cool powerplants into his rides without legal ramifications. 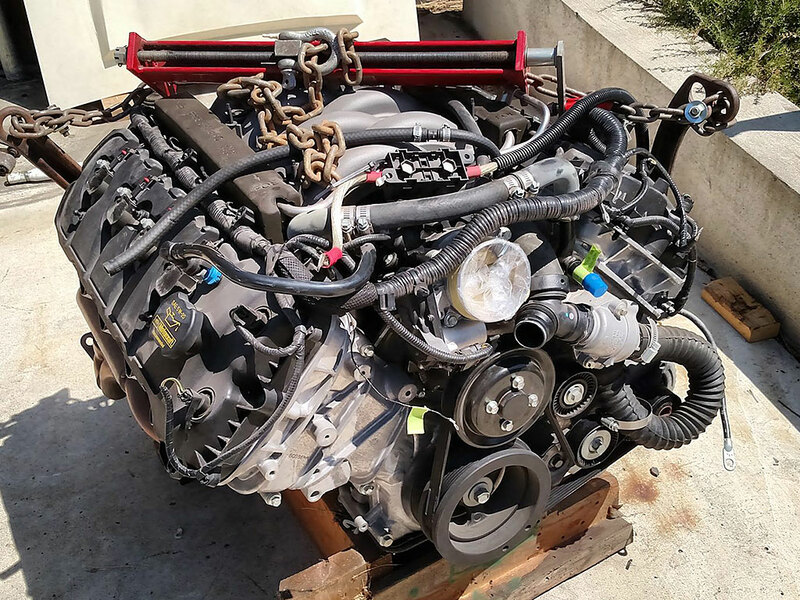 A Coyote crate engine from Ford Performance puts modern performance under the hood of this supercar build. 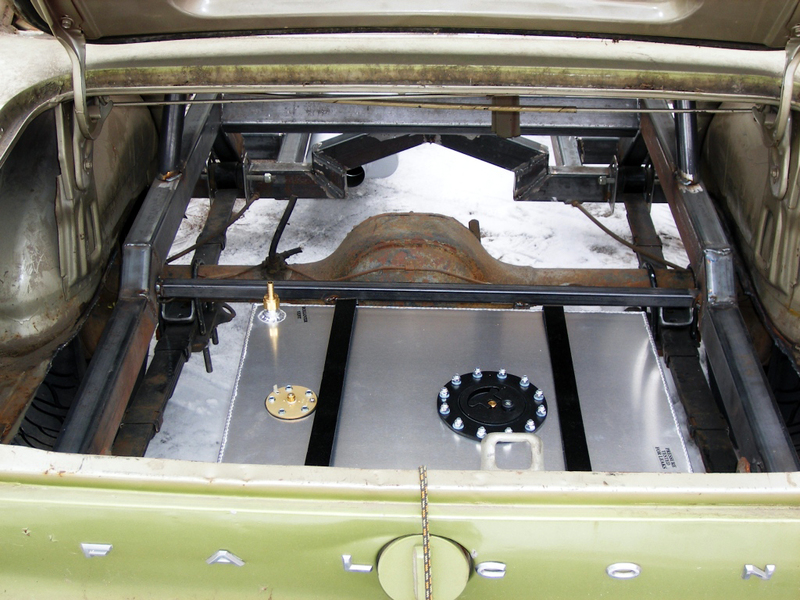 These shots give you an idea how well the wide body Coyote fits within the narrow engine compartment of the Falcon. 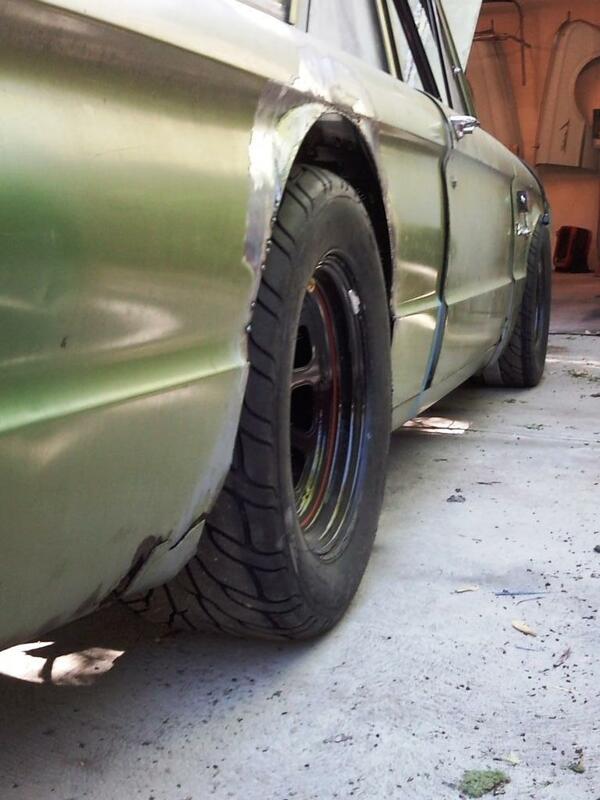 Up front, Tom used a Rod & Custom Mustang II front end with manual rack and pinion, coil overs and 11 inch slotted and drilled rotors. 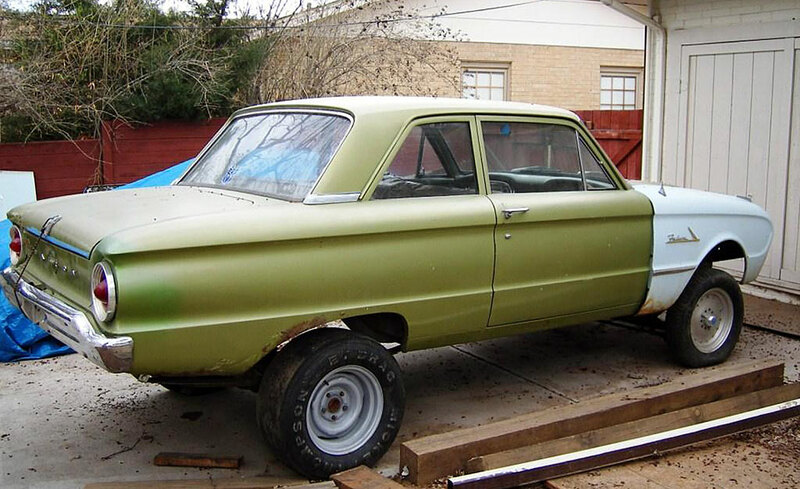 The previous owner of the Falcon was angling for the Gasser look, but didn't quite pull it off. It doesn't look like much here, but that was fixing to change dramatically. Tom decided the car worked better as a sixties stock car replicar and his concept proved stunningly correct. He spotted a diamond in the rough and knew he could reset it with all the right changes. 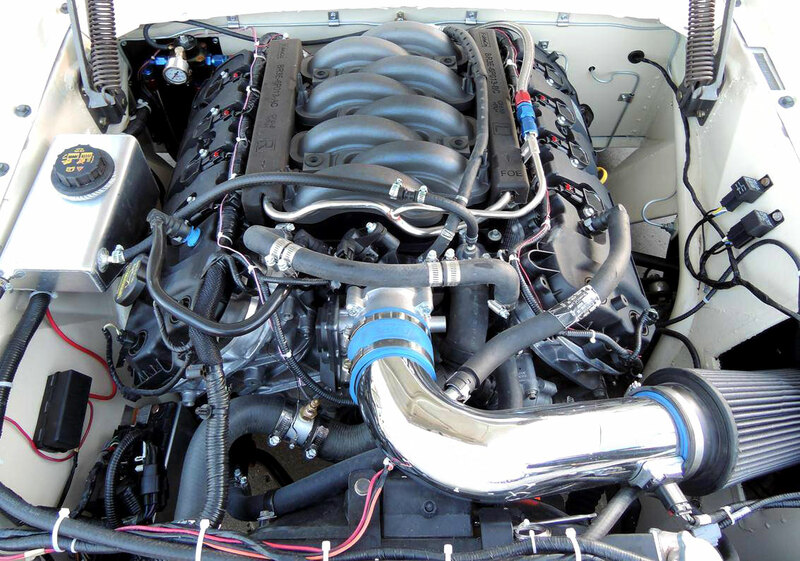 He became a fan of Ford's Coyote engines when he bought a coyote powered Mustang and since then that has been his go-to power plant for all his swap projects. This one turned out be be a real prize and it reflects Toms keen vision and skills in making it happen. 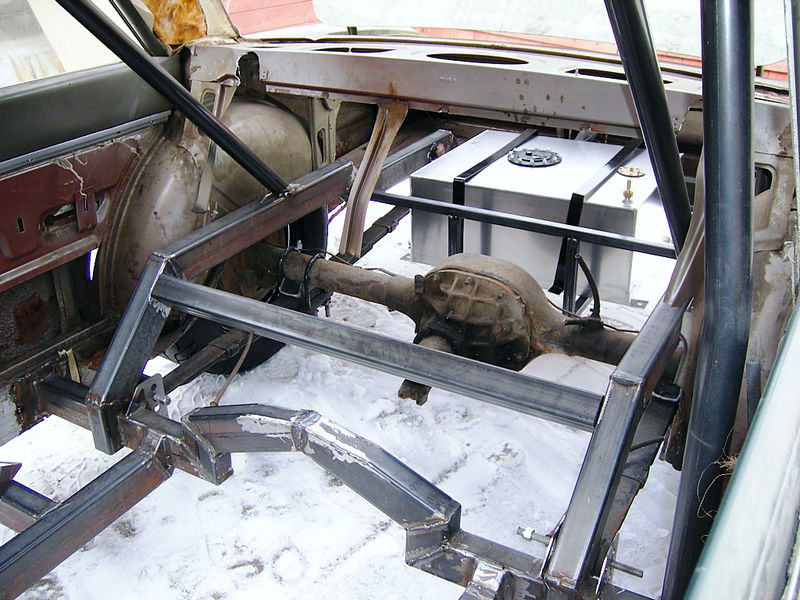 The floor and chassis were pretty well shot so Tom resolved to correct that by fabricating his own tube chassis from 2x3 and 2x2-inch mild steel tubing. 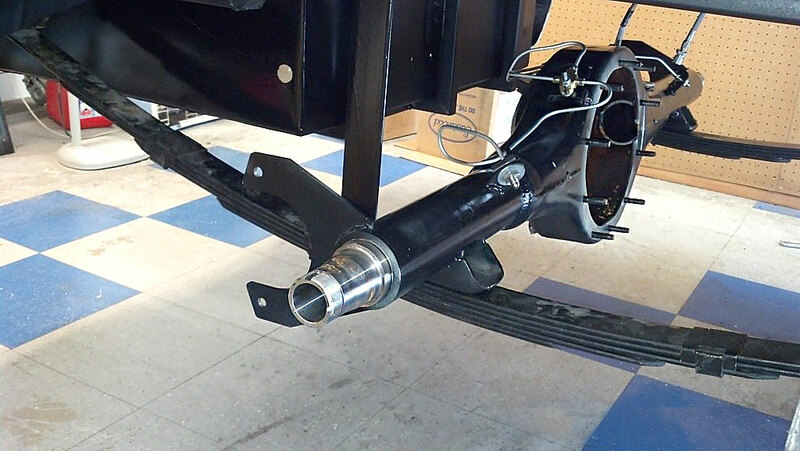 It's easy to cut and fit, easy to weld and creates a strong rigid structure from which to hang suspension member and support the body. 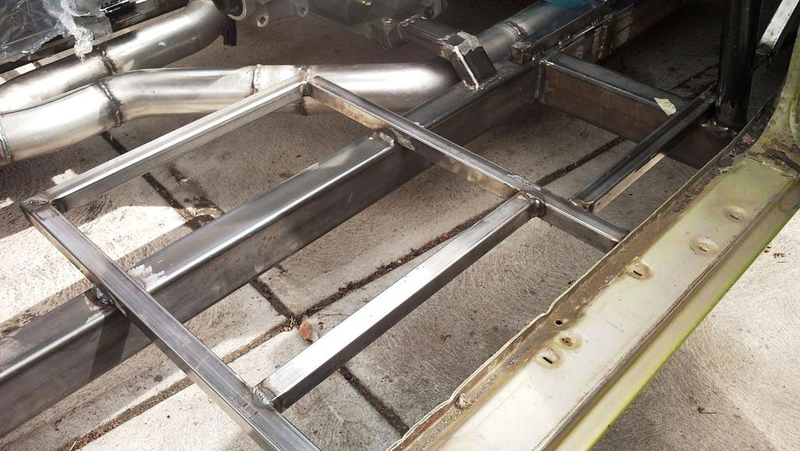 Extra tubing was required to form a proper floor support that was then finished with fabricated panels welded up by Tom. the drive tunnel work here is pretty intricate and took a lot of effort. 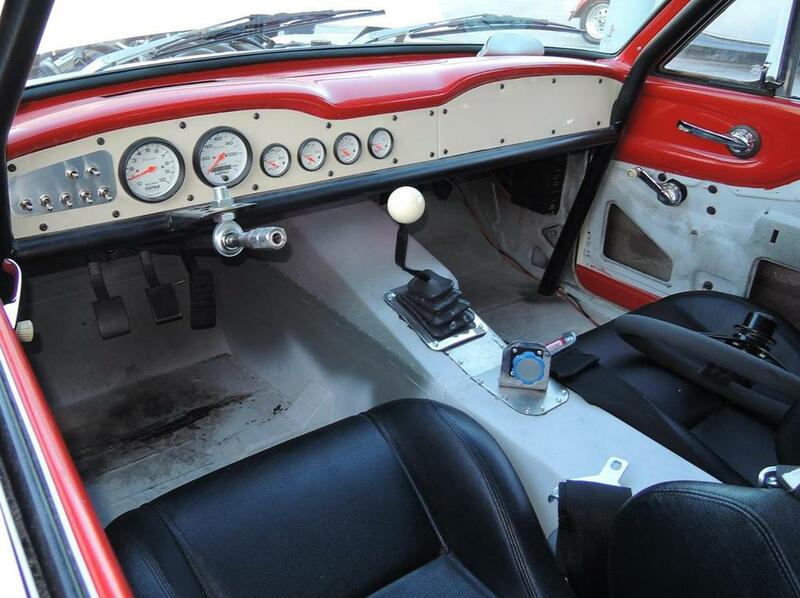 Note the shifter for the TKO 600 5-speed trans. 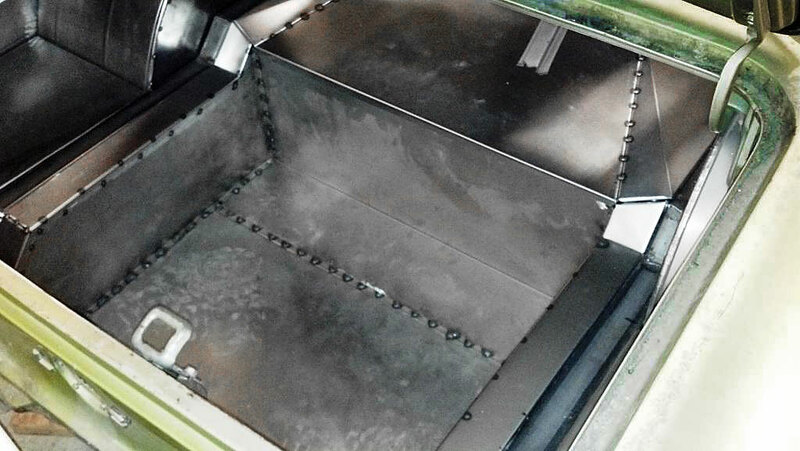 This project required a lot of mock up and trial fitting to ensure compatibility between all the components. 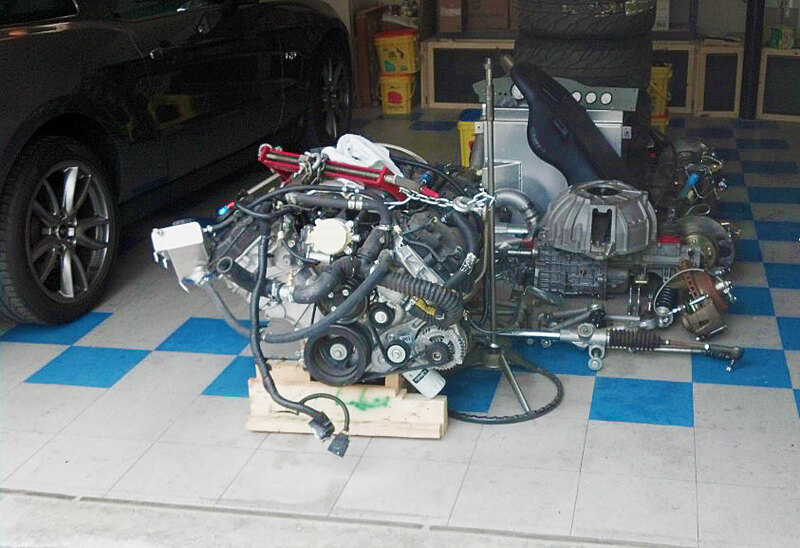 Here the engine is being trial fit with the main frame rails. 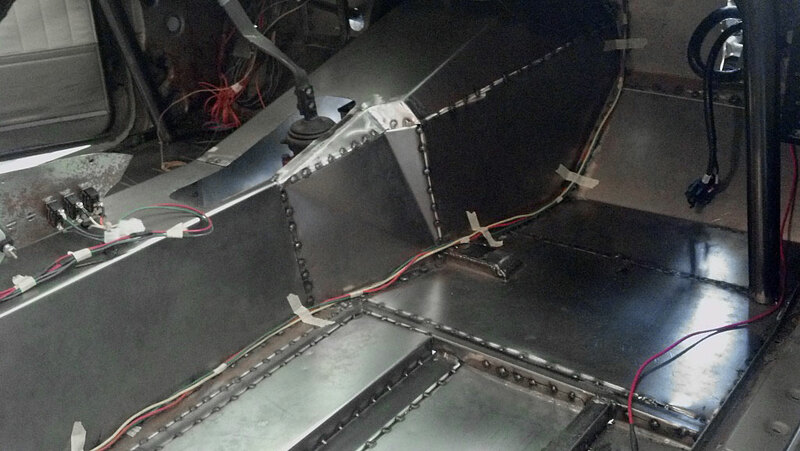 At the right is the finished metal work for the floor of the trunk. A substantial pile of parts accumulates during the process. Many of them go into and back out of the car repeatedly as fitment adjustments are made. 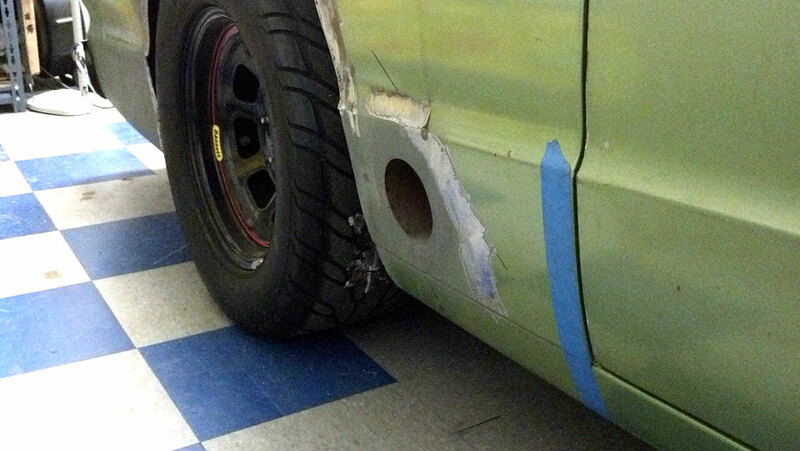 Of course, this is the essence of hot rodding; making something great from a collection of unrelated parts. 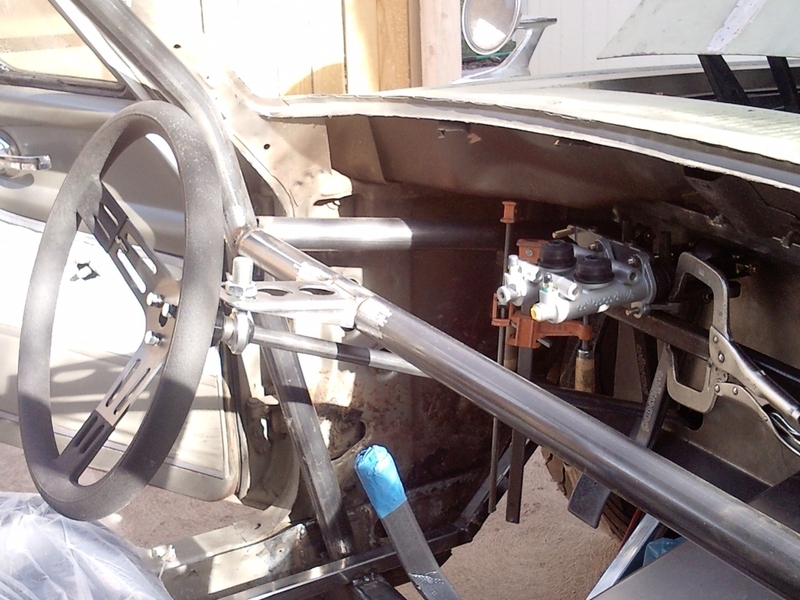 Without knocking the build process for say, a Cobra kit car, this is quite a bit more serious effort as you are basically creating a new car from scratch by fabricating your own kit. For many builders, this is the creative process that fuels their passion and makes good things happen in small garages all across America. 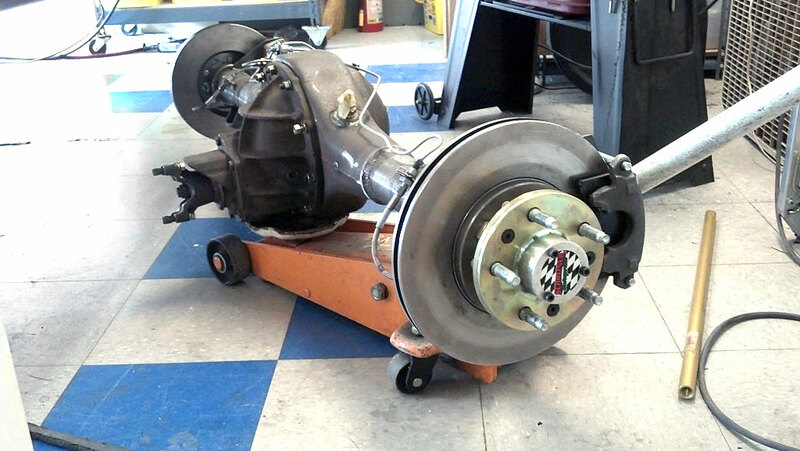 This creative vision still drives an enormous number of people who combine the availability of bolt-on parts with great fabrication skills to build cars that really stand out. 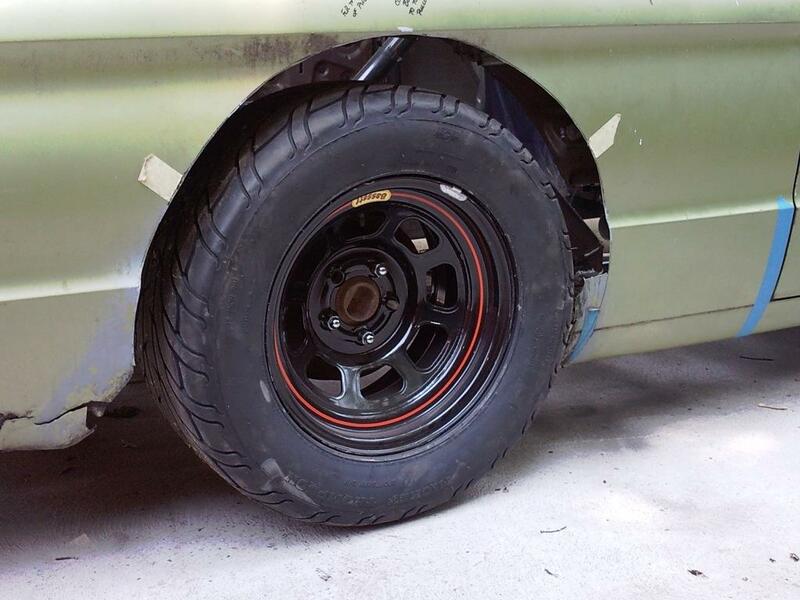 At the rear, Tom opted for a full floating 9-inch posi rear end with 3.70 gears. 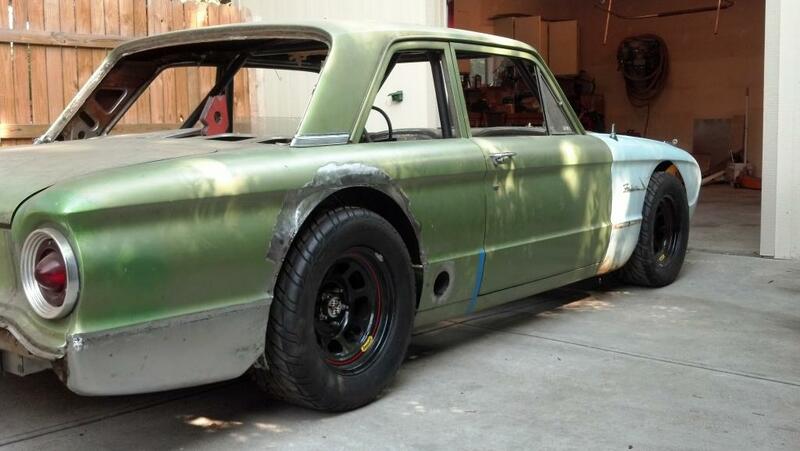 That's a cool choice considering the stock car theme if this build. 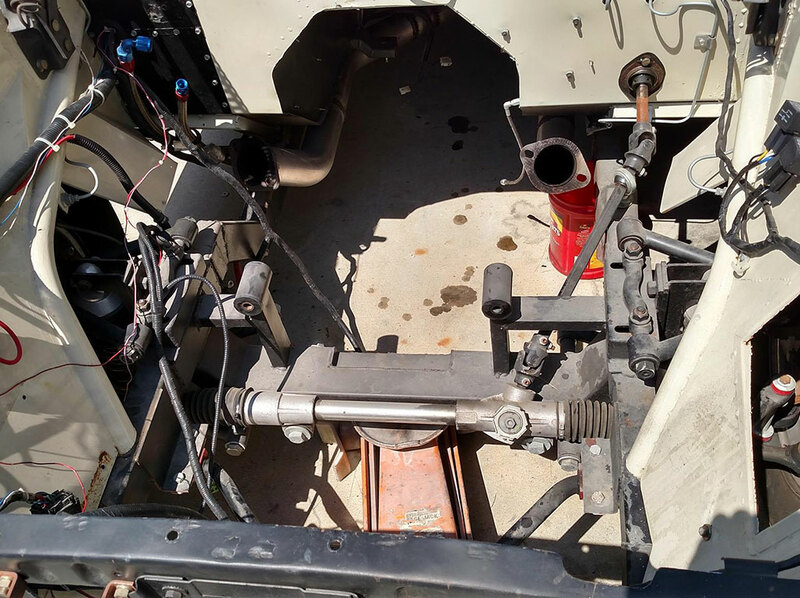 The rearend is anchored by heavy duty leaf springs and a home built panhard bar. 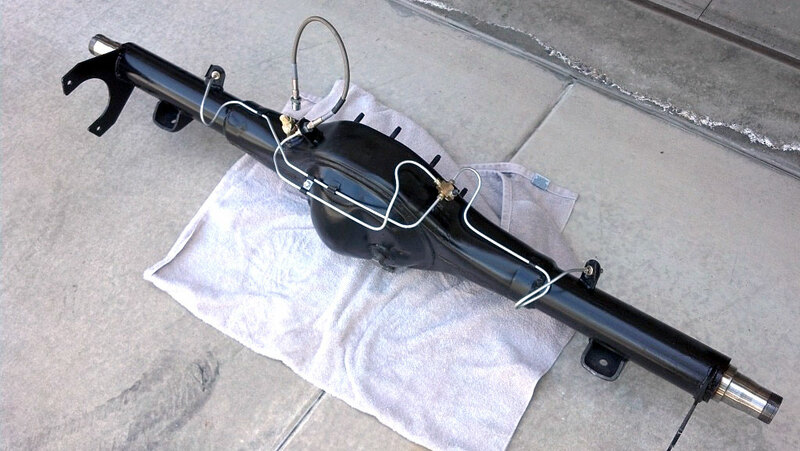 The Ford Coyote crate motor brings the power in spades so Tom had to add a traction aid to the rear springs to control spring wrap up. 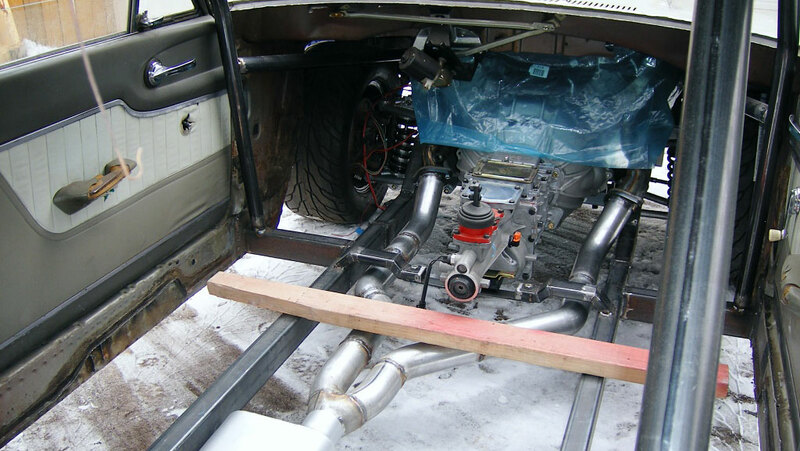 Unique dual muffler system was designed by Tom to facilitate a single exit exhaust ahead of the right rear wheel just like a real stock car. Herre is the previously mentioned right side rear exhaust that uses a pair of mufflers strategically placed within the chassis to accommodate this look. It's pretty keen looking from eithr side. Drivers side is plain and clean, passenger side is subtle but formidable looking. 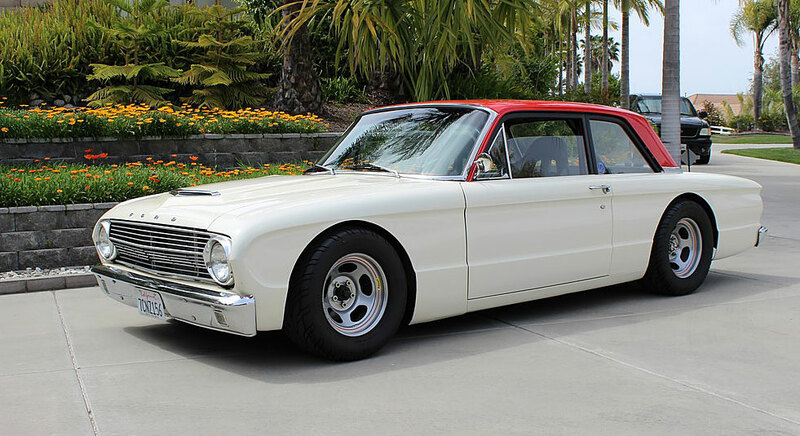 Early Falcons are pretty much overlooked as supercar material, but they are basically Mustangs in sheep's clothing. Given the right treatment, they make great supercars and Tom has put the proof to metal with this awesome build. We thank him for allowing us to share it with you.